My computer and my iPad are deeply involved in transferring, storing, and backing up the thousands of images from my just concluded trip to Mexico and Spain, and will be for some time. Since I can't access the images from this trip, and can't use ArtRage3 with the iPad occupied, I decided to turn to a subject from an earlier trip, to France. And that now was as good a time as any to dip back into watercolor. So, here you have it. 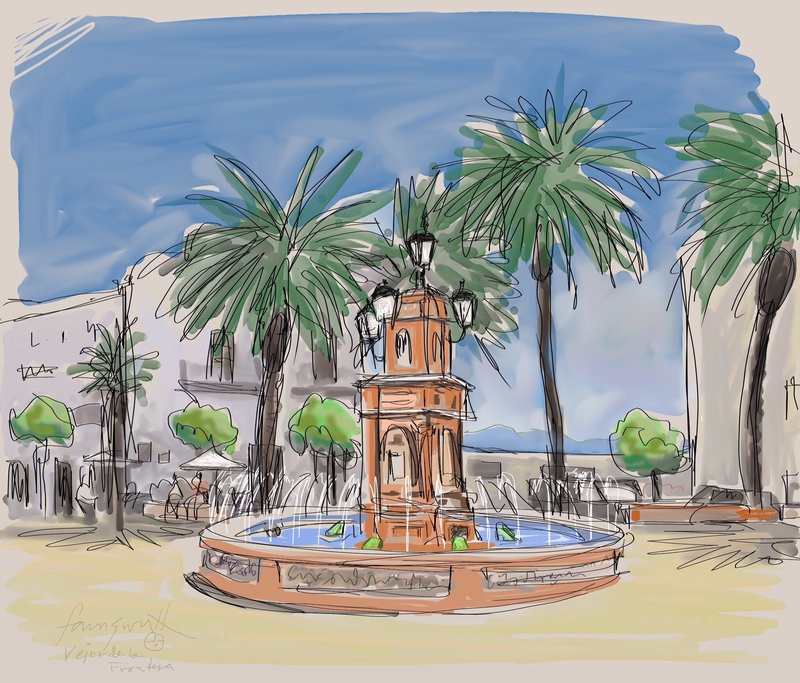 A quick sketch of the fountain where I had my breakfast this morning, after spending the night in Vejer de la Frontera. When I first saw Vejer twelve years ago, it was from the highway as we passed by below the village. The driver, from Hacienda Dos Olivos, told me it was one of the Pueblos Blancos, a term I was not familiar with, but that intrigued me instantly. Vejer was so striking, perched atop a hill covered in green trees and fields, sparkling in the afternoon sunthat I swore to return someday. A few days later, I rented a car and started my first tour of the Pueblos Blancos, and spent the first night and the next day in Vejer. Breakfast, by the way, was a delicious tapa of Smoked Eel cooked with black butter and capers on a bed of roast sweet potato on rye toast!!! Mmmmmm! And on that note, I believe I will go to sleep, now, and dream of smoked eel. Just a quick character study tonight. Time to catch up on matters technical. Downloading, uploading, charging, etc. had a great day, walked a lot, watched a lot of people, saw a lot of the city, got thoroughly lost at least once, finally got a large, delicious cup of coffee, and at long last, found my way to some excellent Flamenco after sitting in on about an hour and a half of a very interesting Flamenco class. Now to the tech stuff. 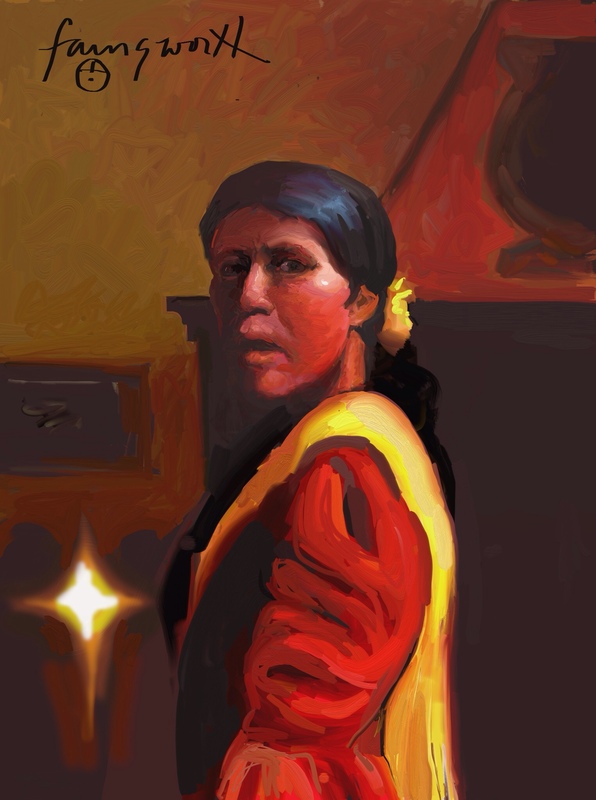 Still exploring the possibilities in the ArtRage app. I like this more traditional work, too, but I miss the lines of the other pieces. Because I again worked alla prima on this one, the few lines I used were either eliminated or absorbed into the painting as it progressed. In other words there simply was no separate line drawing layer. The drawing was almost entirely done with the paint. Tomorrow is train day, back up to Sevilla, so I'd better get some sleep. 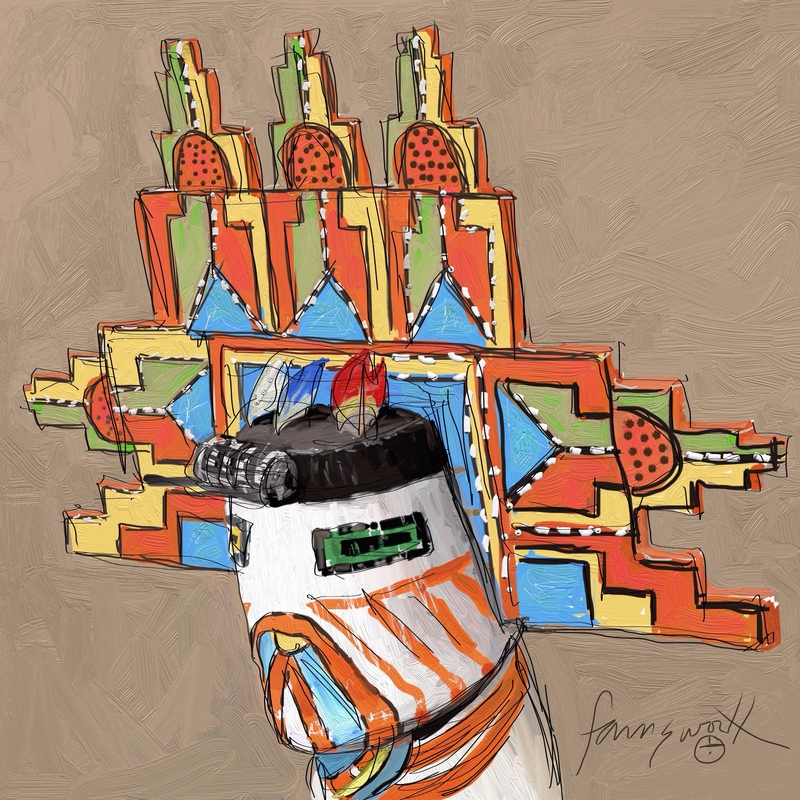 I just had to do another kachina on my iPad. And who better than the beautifl Pahik Mana for my model. Unlike the Qõqõlo that I did recently, I wanted this one to have the sketch lines showing. I like this effect. I would love to hear your opinions. On another note… Yipee! I have finally managed to get my Lumix Link wifi app working so I can move images from my camers to my iPad Air. I won't bore all of you with the details, but if any of you have questions abou this, just shoot me an email and I will be happy to help you any way I can. Happy Easter, everyone. Monday marks the beginning of my revisit to the famous Pueblos Blancos. I think you're going to enjoy this. As much as I've appreciated this past week of rest and work and routine, it will be good to be moving again. Nah, Still no Flamenco here, due to all the Semana Santa activities. 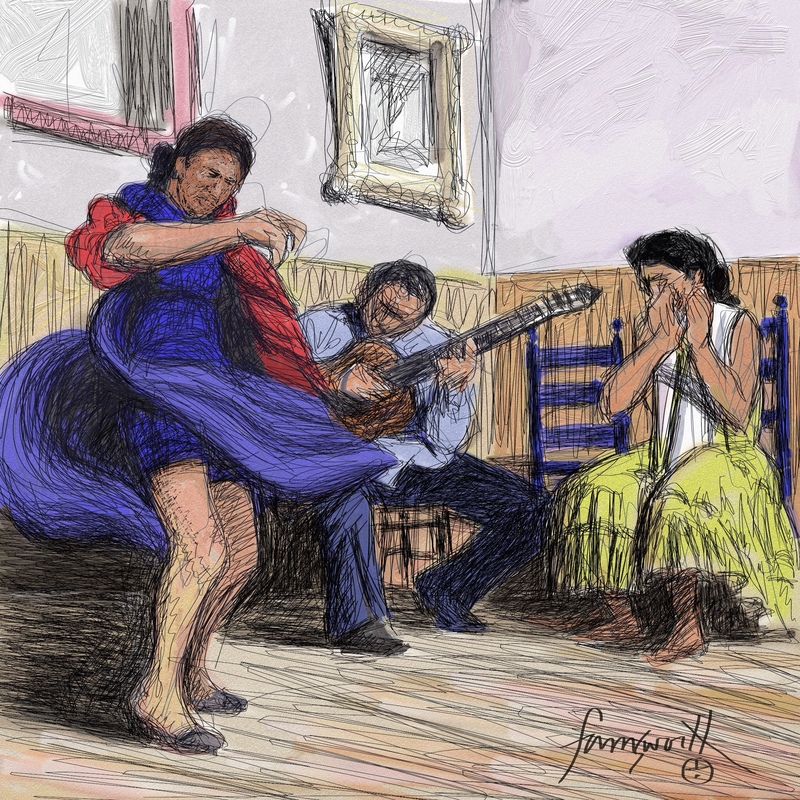 This is done from a photograph I took on my first visit to Jerez de la Frontera, back in 2001. I'm just getting a little anxious, I suppose. I tried going for a colored inks effect. I'm not too happy with the result. I like Flamenco SMA from a couple of days ago much more than this one. So much still to learn with even this one app. 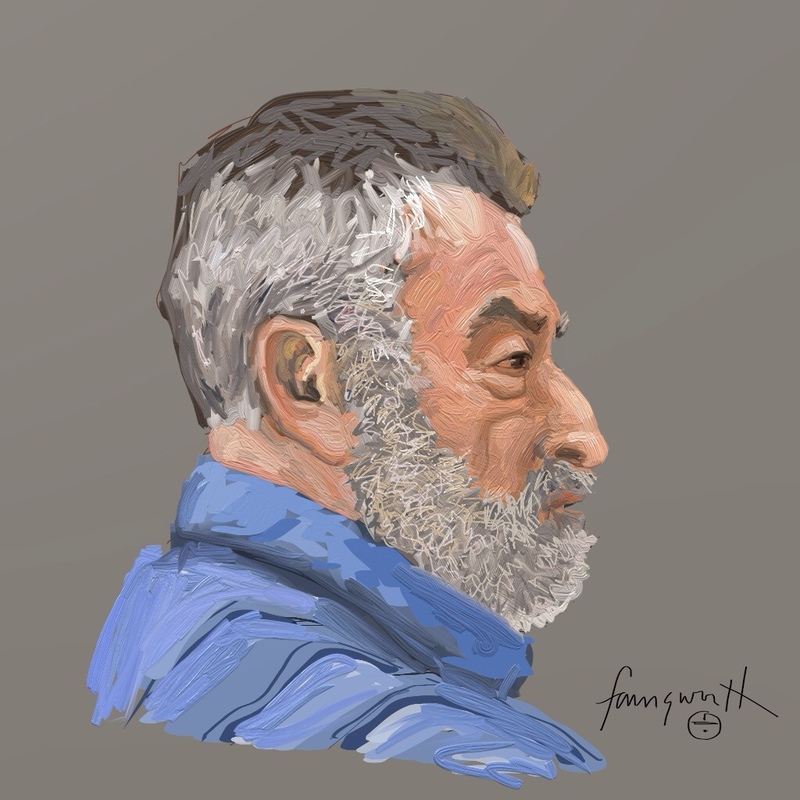 I'm really excited about the ability to maintain the original sketch with all its searching and wild, uncontrolled exploration of the subject along with the more careful, refined paint application. My early thinking and preliminary work has always been obliterated by the finished work. Except in watercolor, that is, in which, until recently, i did no preliminary drawing just went directly into the painting with no guide lines at all. Then there were the confections. 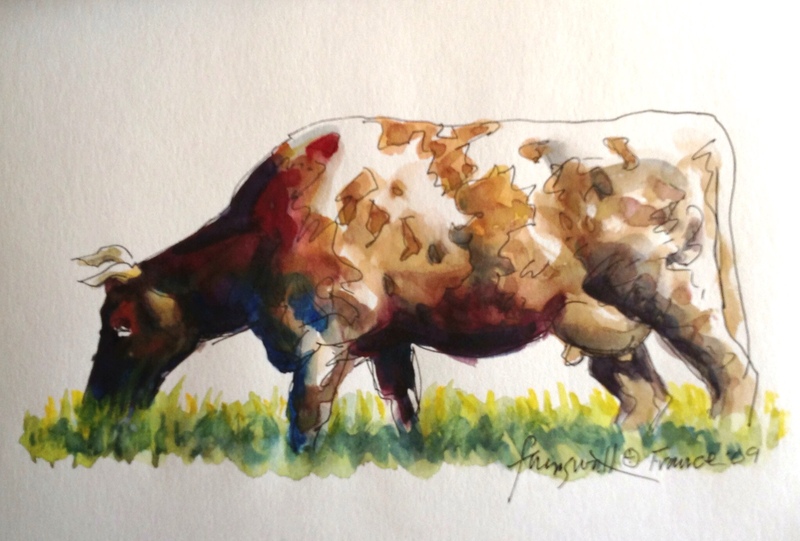 Loose, spirited line drawings with touches of watercolor. Here the original line work remained, however these were more sketches than developed works. I can hardly wait to see what develops tomorrow. Ah, the fauxtographer, you see them everywhere. Gearheads all. Thousands of dollars worth of cameras and lenses hanging from neck and shoulders, searching, searching. Yet seldom does the camera come into play. Are they waiting for the perfect image to appear before them? Are they too tired to see? Afraid that even with all that equipment they still might fall short of the perfect photograph? Shoot I say! Shoot because by shooting you will learn to shoot better. Fail, because by failing and learning from your failures you will grow. More processions again this evening. I finally managed to transfer a couple of images from my camera to my iPad via wifi. The process is not for the faint of heart. At least now I know for sure that it can be done with the Lumix app that I already have. Just in time, too, as my sd cards are almost all full. Now to sort, delete, and transfer to make way for more. I guess I'd better get some rest.